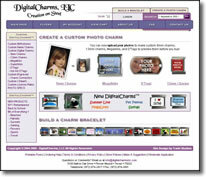 DigitalCharms, LLC is a leading manufacturer of custom Italian modular charms and digital photo charms. Their customized CartFusion solution allows users to upload custom images and see their products before they purchase. Order handling has been drastically improved with the use of CartFusion. Now DigitalCharms can keep track of their pending custom orders with attached images and multiple billing options.